There is a shocking commercial that is making its rounds on TV right now. It shows a little girl going bananas over her annoying toy doll that is making absurd noises while walking around. Suddenly, the mom has “an xfinity moment”. She takes away the doll and replaces it with a computer that is showing the latest episode of Dora. There is no more doll noise. The child is suddenly sucked into watching the screen. And the mom is able to continue reading her newspaper in peace and quiet with her husband. What’s shocking is that this has become our society. The perfect family bonding time is captured in the commercial as a mom and dad enjoying some peace and quiet while their child is occupied by TV. Taken away is the chance for their child to have some imagination time with her toy (admittedly annoying), and it is replaced by the imagination unfolding in front of her in the form of a TV show. All she has to do is watch. And she turns from a loud obnoxious child to a perfect angel of a toddler. As wrong as it is, the honest truth is that I get it. Having raised toddlers, I remember the agony of wanting just 30 minutes a morning to read my newspaper cover to cover without interruptions. I would attempt to make this happen by feeding the munchkin some self-serve food like cheerios or eggs, and then quickly grab the paper and read as much as I could before they decided that cheerios and eggs looked better halfway across the house than on their tray or in their stomach. Then I would gather up some wooden beads, show them how to string them together on a piece of rope, and then read another few pages while the kid grew perplexed at this new task, instinctively ducking as soon as they chose to hurl them at my head. Then I would offer them some non-toxic fingerpaint, letting them create a swirly mess on their highchair tray. This happily lasted 5 minutes as they cooed over the fantastic brilliance of colors all over their tray, then screamed as I fought them from stuffing their multiple colored fingers into their mouth. Then it was into the bath where they splashed and played, me getting a word or two in before giving up because of the raindrops soaking the whole bathroom – including the newspaper. Finally, when they were all snug in their PJs and sedated from the warmth of the bathwater, we would snuggle up on the couch in front of the TV – them blissfully captivated by the Teletubbies, me blissfully captivated by finishing multiple sections of the newspaper in one sitting. And wondering why I hadn’t thought of it in the first place. But sometimes, just to get a bit of peace and quiet, we tend to rely on the TV or some other means of technology-based babysitting just to occupy our children and have a few moments to ourselves. I remember this one time I was enjoying lunch out in a restaurant and witnessed a couple with their young son at the table. While they enjoyed a leisurely lunch together, sharing an uninterrupted conversation with each other, their son was mesmerized by a SpongeBob video on a small DVD player. At the time, I was shocked. Seriously? You cannot teach your child to behave properly in a restaurant without a movie player sitting in front of him? I ate my words when my own son grew up to be the technology slave that he is. Even just to hear a sermon at church, I save myself the embarrassing argument over how bored he is by shoving my iPhone into his hands. Sure, I welcome times when he has to learn to wait his turn to do something that interests him, or learn to keep quiet until it is his turn to speak, or when I entertain him rather than involving myself in my own personal interests. 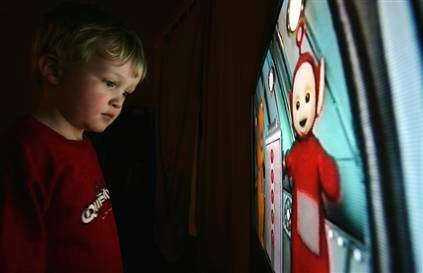 Yes, using the TV or the like in overabundance is definitely unhealthy, and wastes an opportunity to teach them patience and how to entertain themselves. But honestly, when you are a parent of a young child, who isn’t guilty of nixing teachable moments every now and then just for a bit of a break?